+ Paying To Look. TW from Birmingham Museums mentioned the idea of exhibition ticket prices, outlining that families are happy to pay to see dinosaurs, but not contemporary art. 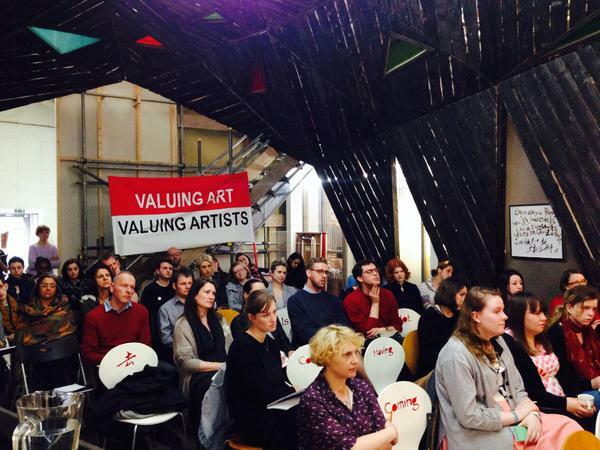 ER raised the point that if exhibitions come with an entry fee this will affect the choice of what is shown, meaning institutions would be more likely to programme recognisable work to which the public have an existing understanding, rather than "taking risks". + Busy Doing Nothing. SW shared that his mom will ask 'Are you busy?' and then ask 'Are you busy with paid work?' His reply: 'It's all paid work, some of it just takes longer to come in.' A desire to change public perceptions of what artists do was expressed by the audience, but this wasn't actually deemed necessary to secure fair payment. + Low Expectations. A lack of assertion regarding how much artists should be paid was raised across the group, but it was clear that we must change habits collectively. It was agreed that the expectations of artists are far too low and that this doesn't end at a particular age. DW urged the audience to "find a way to be more provocative". + The Producers. RC shared how easy it was to think of the cost of artist labour differently to how you would other costs of production, such as hiring a piece of machinery, but that these wereimportant to realign. Without artists there is no art. ER said she wants to see different demographics represented as producers of art and not just as subjects; something put at risk by artists incurring costs rather than being paid fairly for their work. + The Magic City. GW expressed that artists are valuable components that make the city great. RC closed by outlining the potential for Birmingham to take a lead on this issue through good practice and a model for change. Whilst talk began to stretch away from the core issue, hopefully considering it from different creative perspectives (with visual artists, different creative organisations, illustrators, designers, musicians, poets & more in the crowd) can allow ideas to be brought back into the central debate in order to strengthen and enrich it. The campaign's focus remains the belief that artists should be remunerated for exhibiting in publicly-funded spaces, but this is an important conversation that affects all artists everywhere; one that needs a collective voice in order to be heard.